#sweetkindness to first responders all across the U.S. 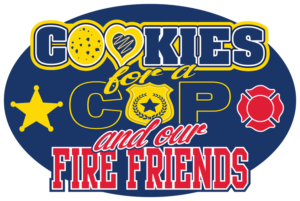 Cookies for a Cop was founded December 4th, 2014 as a way to tell our law enforcement officers that we appreciate them, value them, and want to lift their spirits. This coordinated and highly organized annual event is bringing together approved leaders from across the U.S. to deliver cookies to their local departments, dispatch centers, detention centers, K9s, mounted patrol and more. We have a mission to deliver 2 cookies for every one officer / civilian support personnel in the hopes of bringing a smile to their face. The gift of a cookie is such a kind thing. The gift of tens hundreds of thousands, delivered in a coordinated effort is something beyond amazing! AND THEN WE ADDED RED! Our founder’s roots are from fire service where she grew up in firehouses and cheering her hero dad each time he and his fellow firefighters headed out to save the day. As an adult, she now has a brother on each side of the coin – one with fire service, the other in law enforcement. With this history, it only made sense to add the the fire community by making deliveries our friends in red an official addition. This decision has proven to be an extremely popular move with many, many fire departments on the list to receive their own dose of sweet kindness each October. Starting as a random idea in 2014, this annual campaign has turned into something so much bigger! With our first campaign and just 2.5 weeks to plan, we were able to deliver over 30,000 cookies to over 220 departments in 24 states on December 22nd, 2014 and in the few days that followed. We took a simple idea and made it into an amazing statement of support. Each delivery was not just the work of one group or family but with the backing of thousands and it is with this incredible flood that we were able to drive home just how valued these men and women are to us. In seeing the tag “Sweet Kindness from Cookies for a Cop”, they realized that they were a part of something HUGE, something AMAZING. Our 2015 campaign went so much further with our “Fall back on us” event in October 2015. We surpassed the 100K mark and delivered over 116,000 cookies to departments, correctional centers, and dispatch centers in 28 states. Our 2016 campaign was an exciting one with several new items added to our mix. First came the official addition of our FIRE FRIENDS. We had been making unofficial visits to deliver kindness along the way but it was this year that we made it official and set out to cover as many as we could in the Greater Cincinnati / NKY area with the (successful) hopes that this idea would spread. We also add our STREET PROJECT. The Street Project was our way of spreading kindness and smiles to random individuals along our delivery routes. Whether we were downtown or in the suburbs, we passed cookies and smiles to so many. It made for a fun way to interact with strangers while putting a smile on their unsuspecting faces. Last but not least, we also went INTERNATIONAL this year with the addition of stops to a few army bases in Germany! As of our 2018 campaign, our military friends in Germany are still with us and serving up kindness. The year we surpass 1/2 MILLION acts of kindness (aka: cookies) delivered since our inception! Since our start, we have tracked every cookie and it is in 2018 that we surpass that 500,000th cookie delivered! To think that this whole journey started with the thought that we were going to deliver a few dozen cookies and now we are here less than 4 calendar years later ready to hit this milestone is nothing short of amazing. This is made possible by our friends, families, leaders and the countless army that has joined forces to put in the work to make this a reality. HOW EXACTLY CAN I HELP? If this all sounds like an amazing adventure that you’d want to be a part of, you are in luck! There are various ways in which you can get involved. DONATE: If you’d like to contribute financially or to our HQ Wish List (live and updated during the months of September and October (until all needed supplies are purchased), YOU CAN DO SO HERE. LEAD: If you’d like to take on a department (or even part of a department), dispatch center, firehouse, correctional institution, etc, you can learn more and apply to lead HERE. SHARE: As silly as it may possibly seem, even sharing our mission, our posts, our website is a great way to help us grow. The more people know about us and see our name and our mission, the more opportunities come for growth.